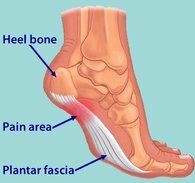 Plantar Fasciitis is the most common form of heel pain. It often occurs in middle-age people but can also occur in the younger population who are on their feet for extended periods of time. The plantar fascia is a ligament that supports the arch of the foot. When the ligament is irritated (stressed or sprained) it gets weak, swollen and painful. This condition is called inflammation. Inflammation can also be a result of micro-tears in the plantar fascia, which occur from repetitive stresses on the sole of the foot. have tight Achilles tendons or calf muscles.